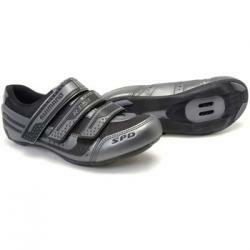 These are a lightweight shoe suitable for sport touring or commuting use. They have a breathable nylon mesh and polyurethane coated split leather upper with reinforced toe area and a three wide Velcro-style hook-and-loop strap closure system which supports the foot without applying pressure. Weight: 584 g for a pair of size 40.